By all accounts the June meeting was a ton of phun! Rodger Harrison played his heart out and Stacy and Anne treated us well, as usual. Ron Wike won the 50/50 raffle... hmmm…what did you spend it on Ron? Join us for our August meeting in Chester! Details TBA. Ron at our June meeting with a table on his head? The Sandlapper Parrothead Club will be camping at beautiful Lake Wateree this weekend. Sandlapper PHC member, Roger Allen, has offered us the use of his property for a weekend of fun, camping, music and more. The club will supply 2 porta-jons with hand wash stations…one for the ladies and one for men. Bring your floats, grills, campers, tents, boats, food and drinks and come join the fun! 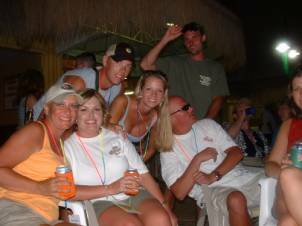 There is no charge for this party and NO purpose except a great time with your phello Sandlappers! No one under the age of 18 please. The address is 652 Colonels Circle, Ridgeway, South Carolina. Wow…I really don’t know where to start! Thank you to every Sandlapper who participated in Parrotstock! Your support and hard work are what made Parrotstock a success this year. I have NO doubt about that! I hope you all had fun and that it’s an event you will want to participate in next year! The music was great and the venue worked out very well. Rhonda and Brian became engaged and we were all very proud to witness it! They’ve set a wedding date for March 6th. There was ocean skinny dipping, mucho tequila consumed, a great party with alcohol and music by The Caribbean Cowboys at 10:00 in the morning and lots of fun people there! Honestly, if you missed it this year, you won’t want to miss another one! Thanks to Sandlapper PHC member Teresa Watkins for painting the rocking chairs and table for Parrotstock And thanks to Mark and Karen for getting them ready to paint! 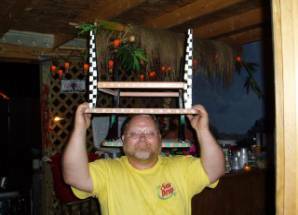 Parrothead Club of the Month! 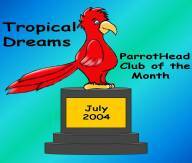 The Sandlapper Parrot Head Club has been chosen as Parrot Head Club of the Month for July 2004 by Tropical Dreams. 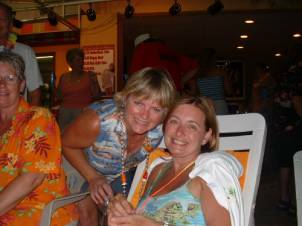 Check out the write-up on www.tropicaldreams.net. beside a recycling center and a single wide trailer that is an EMS substation. This is Wateree Rd. After 4.8 miles you come to another stop sign. You will have passed over 1 bridge already-Wateree Bridge. Veer to the left. This is River Rd. After 2 miles you will pass the State Park on your left. After 8 miles, my road is a dirt road on the right named Antioch Cemetery Rd. There is a big, stone sign that reads Egret Shores. If you hit Colonels Creek bridge and the landing you have gone a little too far. Down Antioch Cemetery rd. take the first left onto another dirt road. Go to the end of the dirt road and have fun! “License to Chill” CD to be released this week! Buffett’s new CD will be released this week. Look for it in your local music store.